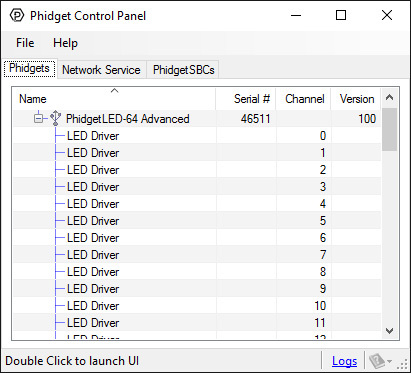 This Phidget controls the brightness of up to 64 LEDs. Replaced by the 1032 - PhidgetLED-64 Advanced. The PhidgetLED 64 allows you to independently control 64 Light Emitting Diodes. Each LED can be turned on and off, and its brightness controlled. Most standard LEDs with colors such as red, amber, orange, yellow, and green have forward voltages below 2.75 Volts, and can be used with the PhidgetLED by simply soldering them to a connector-wire and inserting the wire into any PhidgetLED board connector. The forward voltage will default to 2.75V, and the maximum current defaults to 20mA. The 1031 is capable of adjusting the forward voltage supplied to the LEDs with 1.7, 2.75, 3.9 and 5 volts settings allowing you to properly drive blue, white, violet, ultra violet and purple LEDs. Bi-color LEDs, tri-color LEDs, seven-segment displays, bar LEDs, and other array-style arrangements of LEDs can also be used with the 1031. The maximum current can be set to 20, 40, 60 or 80mA, and applies to all LEDs. The API allows the brightness control of individual LEDs. Note: Cut the Double Ended cables in half and solder the cut end to the LED. Check the Getting Started section of the User Guide for more detailed information. January 2013 Product Discontinued. Succeeded by the 1032 - PhidgetLED Advanced. The main improvement of the 1032 is the ability to set the current limit of each channel separately. Connect the power supply to the barrel jack. If your power supply does not have a jack, you can connect the wires to the power terminal beside it, making sure the polarity is correct. Connect LEDs to the PhidgetLED's outputs. You can slide the pins of an LED into the connector (short end to a black wire, and the long end to the red wire beside it), or you can cut the LED cable in half and solder the LED on. Connect the PhidgetLED to your computer using the USB cable. Now that you have everything together, let's start using the 1031! In order to demonstrate the functionality of the 1031, the Phidget Control Panel running on a Windows machine will be used. Linux users can follow the getting started with Linux guide and continue reading here for more information about the 1031. From the Forward Voltage drop-down menu, select the appropriate voltage for your LED. It is recommended to set the forward voltage to the first setting above the maximum voltage specified by your LED's datasheet. 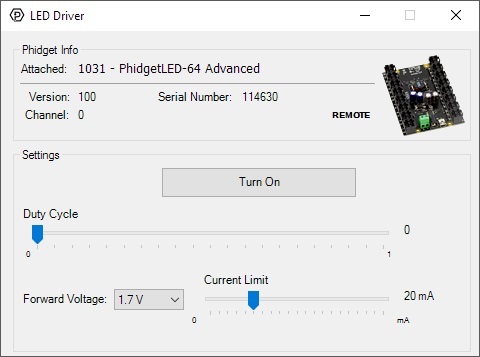 Use the Current Limit slider to set an appropriate limit for your LED. The current limit will be specified in your LED's datasheet. Use the large button to toggle power to the LED. 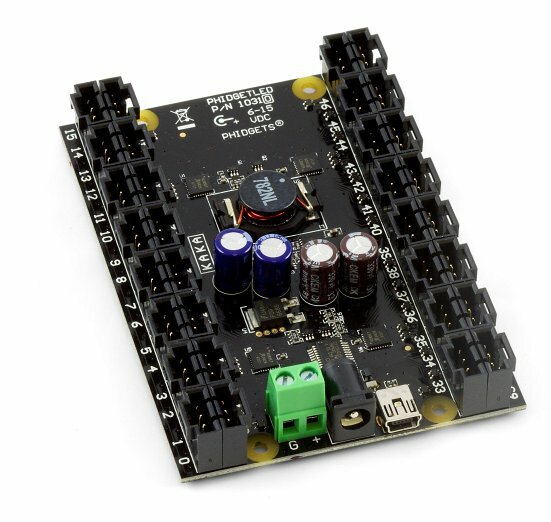 Use the Duty Cycle slider to precisely control the amount of power supplied to the LED. The 1031 uses four controller chips that allow you to vary the current and voltage supplied to each channel. It does not use pulse-width modulation, another common control method for LEDs. 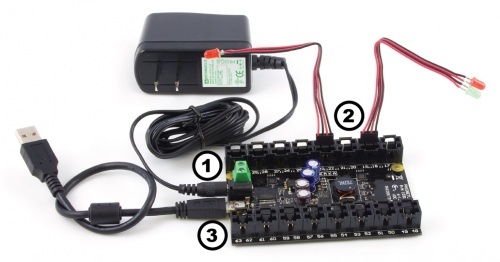 You can have multiple LEDs hooked up to a single channel on the 1031, (for example, a short string of LEDs) to reduce the amount of wiring, although keep in mind that you'll lose control of the individual lights, and can only toggle or dim the entire string. When using multiple LEDs on a single channel, you'll need to increase the voltage limit for that channel. If the LEDs are too dim at the maximum voltage, you should spread them out to other channels. If you're using high-current LEDs, you should spread your load evenly across the board to avoid having one of the controller chips overheat. There are four controller chips, each controlling the channels on a quarter of the board. The connector used on the 1031 LED board is a Molex 70543-0003. The mating connector used on our LED cables is the Molex 50-57-9404. For more information, take a look at the LED Primer.